"I can only affirm that he was a man of absolute integrity of mind. 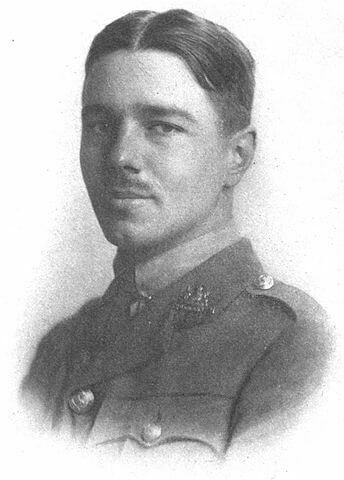 He never wrote his poems (as so many war-poets did) to make the effect of a personal gesture. He pitied others; he did not pity himself. In the last year of his life he attained a clear vision of what he needed to say, and these poems survive him as his true and splendid testament." Owen was born in Oswestry, educated at the Birkenhead Institute, attended London University in 1910. He was tutored near Bordeau where he met the French poet, Laurent Tailhade, who encouraged Owen's writing. Owen joined the Artists' Rifles Officers' Training Corps and served with the 2nd Battalion in France from December 1916-June 1917. He came home for treatment at a mental hospital, and then returned to the same Battalion fourteen months later, becoming its company commander. 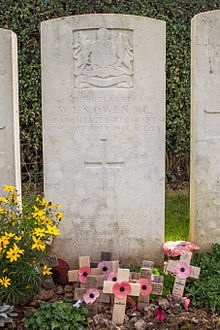 He received the Military Cross for heavy fighting October 1, 1918, and was killed November 4th while trying to get his men across the Sambre Canal. This book is not about heroes...Above all, this book is not concerned with Poetry. The subject of it is War, and the pity of War. The Poetry is in the pity.